In 1958, the very same year that an unknown songwriter named Berry Gordy borrowed $800 to found Motown Records, a pretty young mother from Nashville, Tennessee borrowed $100 from her brother to run a Numbers racket out of her tattered apartment on Delaware Street, in one of Detroit's worst sections. That woman was Fannie Davis, Bridgett M. Davis' mother. Part bookie, part banker, mother, wife, granddaughter of slaves, Fannie became more than a numbers runner: she was a kind of Ulysses, guiding both her husbands, five children and a grandson through the decimation of a once-proud city using her wit, style, guts, and even gun. She ran her numbers business for 34 years, doing what it took to survive in a legitimate business that just happened to be illegal. She created a loving, joyful home, sent her children to the best schools, bought them the best clothes, mothered them to the highest standard, and when the tragedy of urban life struck, soldiered on with her stated belief: "Dying is easy. Living takes guts." A daughter's moving homage to an extraordinary parent, The World According to Fannie Davis is also the suspenseful, unforgettable story about the lengths to which a mother will go to "make a way out of no way" to provide a prosperous life for her family -- and how those sacrifices resonate over time. This original, timely, and deeply relatable portrait of one American family is essential reading. Bridgett M. Davis is Professor of Journalism and the Writing Professions at Baruch College, CUNY, where she teaches creative, film and narrative writing and is Director of the Sidney Harman Writer-in-Residence Program. A graduate of Spelman College in Atlanta, and Columbia University's Graduate School of Journalism, she is the director of the award-winning feature film Naked Acts, as well as the author of two novels, Into the Go-Slow and Shifting Through Neutral. She lives in Brooklyn, NY with her family. "For 34 years, Bridgett Davis' mom, Fannie, ran a numbers racket out of her apartment in one of Detroit's poorest neighborhoods. While the business was illegal, Fannie survived and thrived, raising five kids and a grandson with wit, style and a motto: 'Dying is easy. Living takes guts. '"—Mackenzie Dawson, New York Post "Best Books of the Week"
"Novelist Davis honors her mother in this lively and heartfelt memoir of growing up in the 1960s and '70s Detroit...This charming tale of a strong and inspirational woman offers a tantalizing glimpse into the past, savoring the good without sugarcoating the bad." "[Davis] humanizes the hustle...This book will be a thought-provoking and inspirational delight for anyone searching for understanding in a world designed for only some to succeed." 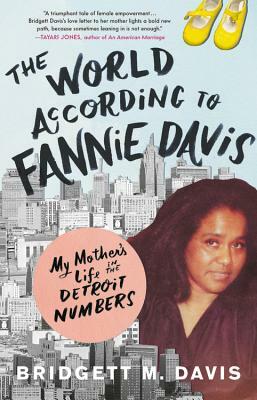 "Fannie Davis is many things - a history of Detroit in its heyday, a sociology of black migrant culture and a taxonomy of the underground lottery of Fannie's era. Davis interviewed family members and conducted research, excavating Fannie's life and times. But the book is not academic in tone. Davis' account of her mother's life and business is first and foremost a loving memoir."